For other uses, see	Sense and Sensibility (disambiguation). Sense and Sensibility is a	novel by	Jane Austen that was first published in	1811. It was the first of Austen's novels to be published, under the	pseudonym "A Lady." The novel has been adapted for film and television a number of times, most notably in	Ang Lee's 1995 version. Elinor and Marianne Dashwood are sisters with opposite temperaments. Elinor is 19, the eldest daughter, and represents the "sense" (reason) of the title. Marianne is three years younger and represents "sensibility" (emotion). Elinor and Marianne are the daughters of Mr. Dashwood by his second wife. They also have a younger sister, Margaret, and an older half-brother named John. When their father dies, the family estate passes to John and the Dashwood women are left impoverished. Fortunately, a distant relative offers to rent the women a cottage on his property. The novel follows the Dashwood sisters to their new home, where they experience both romance and heartbreak. The contrast between the sisters' characters is eventually resolved as they each find love and lasting happiness. Mrs. Dashwood and her daughters Elinor, Marianne, and Margaret, are impoverished after the death of her husband. His estate, Norland, must pass to John Dashwood, his son from his first marriage. Although John promised his father that he would take care of his stepmother and sisters, his selfish wife Fanny easily dissuades him from giving them their fair share of the inheritance. The Dashwood women are treated as unwelcome guests in their former home, and soon begin looking for another place to live. In the meantime, Elinor becomes attached to Fanny's visiting brother Edward Ferrars. Edward is a quiet, unassuming young man with a gentle nature. He has no desire to live up to his mother and sister's desire to see him a famous politician or "fine figure in the world". Although he is not handsome or charming, Elinor soon comes to admire Edward's intelligence and good sense. However, Edward's fortune is dependent on the will of his mother. Elinor knows that Mrs. Ferrars wants her son to marry a woman of high rank, and does not allow herself to hope for marriage. Mrs. Dashwood and her daughters soon move from Norland to Barton Cottage. Their landlord is Sir John Middleton, a distant cousin who generously offers them a low rent. He lives at Barton Park with his coldly elegant wife and their children. Also staying at Barton Park are Lady Middleton's mother, Mrs. Jennings, and Colonel Brandon, an old friend of Sir John. Mrs. Jennings, a jovial old woman who loves to joke and gossip, soon decides that Colonel Brandon must be in love with Marianne. She teases them both about the matter, much to Marianne's confusion. Marianne considers Colonel Brandon, age thirty-five, to be an infirm old bachelor incapable of falling in love or inspiring love in anyone else. When on a walk in the countryside near Barton Cottage, Marianne is caught in the rain. She slips on the wet grass and sprains her ankle. Mr. Willoughby, a dashing and handsome young man, happens to be passing nearby. He races to Marianne's rescue, and wins her admiration and that of her family by carrying her back home. After this incident, Willoughby begins to visit Marianne every day. The two become increasingly intimate, and Elinor and Mrs. Dashwood begin to suspect that the couple has secretly become engaged. However, Mrs. Dashwood's sentimental nature prevents her from following Elinor's advice and simply asking Marianne about her relationship with Willoughby. Marianne is devastated when Willoughby unexpectedly announces that he must go to London on business, not to return for at least a year. 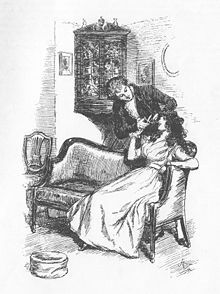 Edward Ferrars comes to visit the Dashwoods at Barton Cottage, but seems unhappy and is distant towards Elinor. She fears that he no longer has feelings for her. However, unlike Marianne, she does not wallow in her sadness. Shortly afterward, Ann and Lucy Steele, cousins of Lady Middleton, come to stay at Barton Park. Sir John tells Lucy that Elinor is attached to Edward, prompting Lucy to inform Elinor in confidence that she (Lucy) has been secretly engaged to Edward for four years. Though Elinor initially blames Edward for engaging her affections when he was not free to do so, she soon realises that he became engaged to Lucy while he was young and naive. Elinor understands that Edward does not love or admire Lucy, but that he will not hurt or dishonor her by breaking their engagement. Elinor hides her disappointment from her family and friends, and succeeds in persuading Lucy that she feels nothing for Edward. Elinor and Marianne spend the winter at Mrs. Jennings' home in London. Marianne writes to Willoughby, but her letters are unanswered. They meet Willoughby at a party, where he treats them in a coldly formal manner. He later sends Marianne a letter informing her that he is engaged to a Miss Grey, a very wealthy woman of inferior birth. Marianne admits to Elinor that she and Willoughby were never engaged, but that she loved him and that he led her to believe that he truly loved her. Colonel Brandon reveals to Elinor that Willoughby had seduced Brandon's foster daughter, Miss Williams, and abandoned her when she became pregnant. The Colonel was once in love with Miss Williams's mother, a woman who resembled Marianne and whose life was destroyed by an unhappy arranged marriage to the Colonel's brother. Later, Mrs. Jennings tells Elinor that Mrs. Ferrars has discovered Edward and Lucy's engagement. Edward refuses to end the engagement and his mother disinherits him. Elinor and Marianne feel sorry for Edward, and think him honourable for remaining engaged to a woman he will probably not be happy with. Ann Steele tells Elinor that Lucy still intends to marry Edward. Edward intends to take holy orders so that he can support them. Colonel Brandon, knowing how lives can be ruined when true love is denied, offers his parish at Delaford to Edward, although he hardly knows him. Elinor meets Edward's boorish brother Robert and is shocked to discover that he has no qualms about claiming his brother's inheritance. Marianne becomes very ill after a walk in the rain during which she was overcome with misery because of Willoughby, and Colonel Brandon goes to get Mrs. Dashwood. Willoughby arrives and tells Elinor that he was left with large debts when his benefactress discovered his actions towards Miss Williams and disinherited him. He then decided to marry a wealthy woman. He says that he still loves Marianne. He seeks forgiveness, but has poor excuses for his selfish actions. Meanwhile, Colonel Brandon reveals his love for Marianne to Mrs. Dashwood. Marianne recovers and the Dashwoods return to Barton Cottage. Elinor tells Marianne about Willoubghby's visit. However, Marianne states that though she loved him, she couldn't have been happy with the libertine father of an illegitimate child even if he had stood by her. Marianne also states that she realises that her illness was brought on by her wallowing in her grief, by her excesive sensibility, and that, had she died, it would have been morally equivalent to	suicide. With particular reference to Elinor's bravery and sense, she now resolves to become a reformed character. The family now learn that Lucy has married Mr Ferrars. When Mrs. Dashwood sees how upset Elinor is, she finally realises how strong Elinor's feelings for Edward are and is sorry that she did not pay more attention to her unhappiness. However, the very next day Edward arrives and reveals that it was his brother who married Lucy. He says that he was trapped in his engagement with Lucy, "a woman he had long since ceased to love", but that she had broken the engagement to marry the now wealthy Robert. Edward asks Elinor to marry him, and she agrees. Edward becomes reconciled with his mother, and she gives him ten thousand pounds, sufficent for them to live comfortably. They marry and move into the parsonage at Delaford. However, Edward's reconciliation with his mother is partial and insufficient. His mother had disowned him for wanting to marry Lucy, but when Lucy married her second son Mrs Ferrars became friendly to her. Mrs Ferrars continues to favour her second son, never reinstating Edward to his former favoured position. Mr Willoughby's patroness does eventually give him her money, stating that his marriage to a woman of good character redeemed him. Willoughby realizes that marrying Marianne would have produced the same effect. He must live with the knowledge that had he behaved honourably he could have had both love and money. Over the next two years, Mrs. Dashwood, Marianne and Margaret spend most of their time at Delaford. Marianne matures and decides to marry the Colonel even though she feels more respect than passion for him. However, after the marriage she realizes that she does truly love him. She and the Colonel set up house near Elinor and Edward, so the sisters and their husbands can visit each other often. Henry Dashwood — a wealthy gentleman who dies at the beginning of the story. The terms of his estate prevent him from leaving anything to his second wife and their children together. He asks John, his son by his first wife, to look after (meaning ensure the financial security) of his second wife and their three daughters. Mrs. Dashwood — the second wife of Henry Dashwood, who is left in difficult financial straits by the death of her husband. Elinor Dashwood — the sensible and reserved eldest daughter of Mr. and Mrs. Henry Dashwood. She becomes attached to Edward Ferrars, the brother-in-law of her elder half-brother, John. Marianne Dashwood — The romantically inclined and expressive second daughter of Mr. and Mrs. Henry Dashwood. She is the object of the attentions of Col. Brandon and Mr. Willoughby. Margaret Dashwood — the youngest daughter of Mr. and Mrs. Henry Dashwood. John Dashwood — the son of Henry Dashwood by his first wife. Fanny Dashwood — the wife of John Dashwood, and sister to Edward and Robert Ferrars. Sir John Middleton — a distant relative of Mrs. Dashwood who, after the death of Henry Dashwood, invites her and her three daughters to live in a cottage on his property. Middleton, his wife, and their children are visited by his mother-in-law, Mrs. Jennings. He and	Mrs. Jennings are a jolly and gossipy pair, taking an active interest in the romantic affairs of the young people around them and seeking to encourage suitable matches. Lady Middleton — The genteel and idle wife of Sir John Middleton, she is primarily concerned with mothering her four spoilt children. Edward Ferrars — The elder of Fanny Dashwood's two brothers. He forms an attachment to Elinor Dashwood. Years before meeting the Dashwoods, Ferrars proposed to Lucy Steele, the niece of his tutor. The engagement has been kept secret owing to the expectation that Ferrars's family would object to his marrying Miss Steele. Robert Ferrars — the younger brother of Edward Ferrars and Fanny Dashwood. Mrs. Ferrars — Fanny Dashwood and Edward and Robert Ferrars' mother. A bad tempered, vain woman who embodies all the foibles demonstrated in Fanny and Robert's characteristics. Determined that her sons should marry well, she ends up disowning Edward in light of his engagement with the expedient Lucy Steele, then ironically embracing Robert for marrying or threatening to marry Lucy. Col. Christopher Brandon — a close friend of Sir John Middleton. In his youth, Brandon had fallen in love with his father's ward, but was prevented by his family from marrying her because she was intended for his older brother. He was sent abroad to be away from her, and while gone, the girl suffered numerous misfortunes partly as a consequence of her unhappy marriage, finally dying penniless and disgraced, and with a natural daughter, who Colonel Brandon takes in. John Willoughby — a nephew of a neighbour of the Middletons, a dashing figure who charms Marianne. Charlotte Palmer — the daughter of Mrs. Jennings and the younger sister of Lady Middleton, Mrs. Palmer is empty-headed and laughs at inappropriate things, such as her husband's continual rudeness to her and to others. Mr. Palmer — the husband of Charlotte Palmer who is running for a seat in Parliament in spite of his idleness and rudeness. Anne/Nancy Steele — Lucy Steele's elder sister. Miss Grey — a wealthy heiress who Mr. Willoughby marries after he is disinherited in order to retain his comfortable lifestyle. Austen wrote the first draft of Elinor and Marianne (later retitled Sense and Sensibility) c. 1795, when she was about 19 years old. While she had written a great deal of short fiction in her teens, Elinor and Marianne was her first full-length novel. The plot revolves around a contrast between Elinor's sense and Marianne's emotionalism; the two sisters may have been loosely based on Jane and Cassandra Austen, with Austen casting Cassandra as the restrained and well-judging sister and herself as the emotional one. Austen clearly intended to vindicate Elinor's sense and self-restraint, and on the simplest level, the novel may be read as a parody of the full-blown romanticism and sensibility that was fashionable around the 1790s. Yet Austen's treatment of the two sisters is complex and multi-faceted. Austen biographer	Claire Tomalin argues that Sense and Sensibility has a "wobble in its approach," which developed because Austen, in the course of writing the novel, gradually became less certain about whether sense or sensibility should triumph. She endows Marianne with every attractive quality: intelligence, musical talent, frankness, and the capacity to love deeply. She also acknowledges that Willoughby, with all his faults, continues to love and, in some measure, appreciate Marianne. For these reasons, some readers find Marianne's ultimate marriage to Colonel Brandon an unsatisfactory ending. The ending does, however, neatly join the themes of sense and sensibility though having the sensible sister marry her true love after long, romantic obstacles to their union, and the emotional sister find happiness with a man she did not initially love, but who was an eminently sensible choice of a husband. The novel displays Austen's subtle irony at its best, with many outstanding comic passages about the Middletons, the Palmers, Mrs. Jennings, and Lucy Steele. 1995: Sense and Sensibility, film starring	Emma Thompson as Elinor Dashwood,	Kate Winslet as Marianne Dashwood, with	Hugh Grant as Edward Ferrars and	Alan Rickman as Colonel Brandon. Directed by Ang Lee, this film was hugely successful. Emma Thompson's Oscar-winning screenplay took some liberties with Austen's story in the interests of a modern audience's requirements. 2000: Kandukondain Kandukondain, a contemporary Indian film set in the present, based on the same plot, starring	Tabu as Sowmya (Elinor Dashwood),	Aishwarya Rai as Meenakshi (Marianne Dashwood), with	Ajit as Manohar (Edward Ferrars), Abbas as Srikanth (Willoughby) and	Mammootty as Captain Bala (Colonel Brandon). ^ Claire Tomalin, Jane Austen: A Life (New York: Vintage, 1997), p.155. ^ Tomalin, Jane Austen: A Life, pp. 156-157. The text is now in the	public domain.